There are a lot of options available to buyers looking for a midsize sport utility vehicle that features a lot of interior space and the versatility needed to accommodate the needs of a large family. Better yet, many of these models have been introduced to the market recently, or completely redesigned. That means that buyers have a lot of options at their disposal, and these options are capable of meeting of variety of needs. That said, the recently-launched 2018 Volkswagen Atlas is probably the only model in its segment that provides versatility, safety, connectivity, comfort, and driving pleasure. Thanks to its German engineering, the brand new Atlas will indeed appeal to buyers that want to have fun driving their vehicle despite its size or the fact that it was designed to be versatile. That’s just one way the new 2018 Atlas stands out against its competition like the Honda Pilot and the Nissan Pathfinder. Indeed, the 2018 Volkswagen Atlas offers a lot more than just a comfortable ride. It is also a blast to drive. Featuring an entry-level turbocharged four-cylinder engine that delivers 235 horsepower, but more importantly a very impressive fuel economy rating. And then we have a more powerful 3.6-liter V6 engine as well for buyers who want more power and capacity. These engine options are just one way the brand new Atlas stands out from the competition, but that’s not all. Indeed, the brand new 2018 Atlas also shines on the road with a driving behavior that is perfectly balanced between comfort and sportiness. When you get behind the wheel of the Atlas, you can immediately tell that this midsize SUV was designed in Germany. It is stable, poised, and always controlled. Its performance is always above expectations, but it is also quite versatile. There is more than 1,571 liters behind the second row of seats which is quite impressive and on par with what is offered by the Pilot. It’s also more than 300 liters more than what you find in the Nissan Pathfinder. 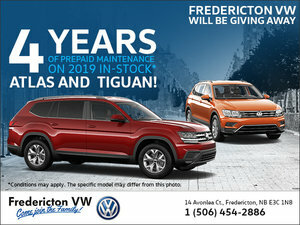 If you are looking for versatility and performance, come check out the brand new 2018 Volkswagen Atlas today at Fredericton Volkswagen!